​Is your pooch starting to turn a little gray around his muzzle? Is his body shape looking a little different? If the answer to these questions is a strong “yes”, then chances are that your dog is entering his golden years. And, if this is the case, then he will have different nutritional requirements. Every dog has specific dietary needs and senior dogs are no exception. Often, pet owners of such dogs have tons of questions: Is buying him senior dog food necessary? 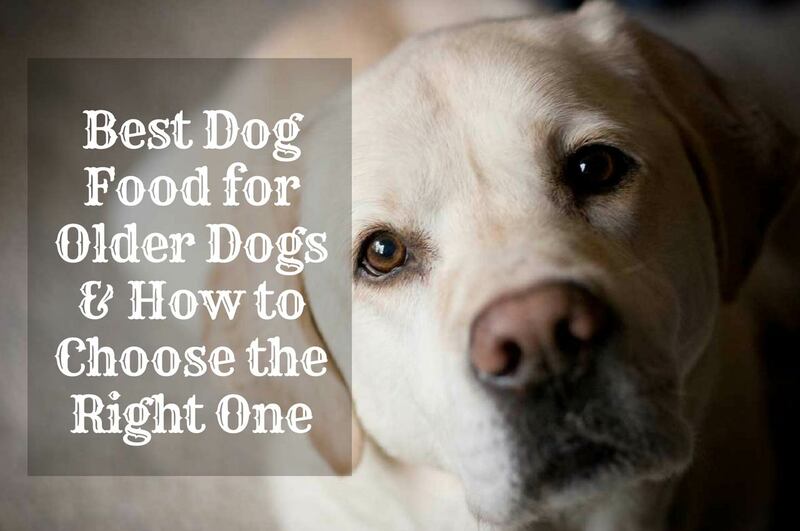 What is the best senior dog food brand? What can be done if he’s refusing to eat senior dog food? Which is best for an adult dog or senior dog's diet: wet grain-free dog food or dry food? This article tries to answer this and more questions regarding the best dog food for older dogs. As your dog ages, he becomes susceptible to certain conditions. The good thing is that senior dog food is designed to help your pooch manage these physical and medical changes. If your pooch has just crossed to his golden years, here are a few things to keep in mind when buying him senior dog food. The protein stores of older dogs get depleted more quickly than in younger dogs and, just like humans, senior dogs start losing muscle mass as they age. That said, senior dogs require foods that have high protein content. This way, they can replenish their protein supplies and make up for the muscle loss. Advisably, an older dog’s diet should have at least 75 grams of protein per 1000 calories. But there’s one thing you have to be cautious about when increasing his protein intake—even if it is high-quality protein. With most food for adult dogs, the phosphorous content increases parallel to the increase in protein, and this can be detrimental for pups that have kidney disease. Therefore, you should find a way of reducing phosphorous intake to prevent progression of the disease. Some older dogs really grapple with attaining the right weight. If you realize that your dog is losing weight too fast, consult your vet about underlying health problems that could be affecting his appetite, calorie needs, or digestive system. If the problem is his muscle mass, then switch to a high-protein diet. But if he’s getting thinner because of a different reason, you should consider adding more calories to his diet. In contrast, a low-fat diet is the best option for older dogs that are struggling with excess weight. There are two main kinds of fiber: soluble and insoluble. While soluble fiber serves as food for bacteria, the insoluble kind helps in adding bulk to his stool so that the bacteria cannot break it down. There are also mixed fibers such as psyllium, which blend both the soluble and insoluble, and they’re in common in senior dog foods. Mixed fibers are great for improving the general health of your pup’s gastrointestinal system. If your older dog is suffering from constipation, a diet that is high in fiber content can help. However, be cautious not to feed him too much fiber as this can compromise his ability to absorb other essential nutrients. When it comes to the calorie intake for senior dogs, there’s no one-size-fits-all answer. Finding the right calorie density will depend on whether he needs to gain or lose weight. If your senior dog needs to gain weight, then incorporate at least 450 calories per cup of kibble. However, if he has to shed a couple of pounds, the appropriate thing would be to feed him less than 350 calories per cup of kibble. Generally, most vets recommend low-calorie diets for senior dogs since these dogs are not as active as they were when they were young. In fact, your pup’s activity level may decrease by as much as one-third once he ages. Dogs’ digestive systems change considerably as they age. But how these changes affect the way they digest different nutrients is still being researched. According to one study performed in 2005, aging is not the only factor that affects a pup’s ability to digest food. The one thing that people agree on is that older dogs are more vulnerable to digestion-related problems such as food allergies, inflammatory bowel disease,and pancreatitis. Nonetheless, the best diet for your senior dog, whether he has health problems or not, is one that is specifically tailored for him. Some dog food manufacturers try to modify foods for senior dogs by adding more soluble fiber or by increasing the fat content. The truth is, some of these adjustments are not necessary. Every dog breed digests nutrients differently. So, if your senior dog is showing little interest to a particular food, you should switch to something else. As your pup ages, he becomes more susceptible to arthritis, especially if he’s obese. For such a dog, you should supplement his diet with glucosamine and/or chondroitin, which help to reduce arthritis symptoms. Also, consider foods with omega-3 fatty acids such as EPA and DHA. Both of these nutrients have been proven to minimize inflammation in the joints and arthritis symptoms. 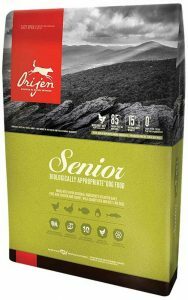 If you have a medium to large dog breed, this senior dog food by Orijen is the best on the market. It boasts high-quality ingredients that will help your pup to age healthily. Orijen uses a simple formula that centers on only the essential ingredients that can benefit older dogs. This particular recipe consists of limited ingredients that will benefit medium to large aging dogs. The main sources of proteins for this dog food are chicken, turkey, and wild-caught fish. This makes the food suitable since such proteins are easier for senior dogs to digest. Also, Orijen senior dry dog food is designed to be easy on your pup’s stomach—so you won’t have to worry about him getting constipation and other digestion-related conditions. Since this dog food contains 400 calories per cup, it will be easy to portion out the meals depending on the size of your dog. 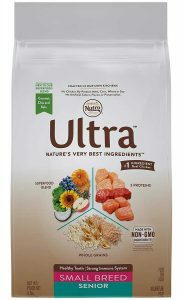 The Nutro Ultra is another senior dog food, although it’s mostly recommended for small dog breeds. With this food, you are guaranteed that your pup will be getting all the nutrients he needs to stay healthy as he ages. Nutro Ultra is made of 12 super foods that have been tested and proven beneficial to senior dogs. These include ingredients such as pumpkin, sunflower oil, apples, and flaxseed just to mention a few. Combined, these ingredients provide your pup with essential vitamins and antioxidants. Its protein sources come from chicken, lamb, and salmon. Any other ingredients incorporated in this dog food are non-GMO and free of corn, soy, and wheat. 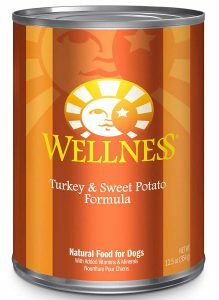 If your pooch seems picky about dry dog food, this canned food by Wellness Complete is an excellent option to consider. The Natural Wet Dog food will keep your pooch hydrated and healthy. Plus, it contains a good balance of nutrients and it’s designed to cope with the problems that older dogs encounter. This canned dog food is made up of 7% proteins, which come from chicken, chicken liver, and ocean fish. It also contains sweet potatoes and ground barley to boost your pup’s digestive system. To improve his skin health, it also incorporates flaxseed. Other beneficial ingredients include carrots, which provide a ton of micronutrients including antioxidants, vitamins, and carotene. 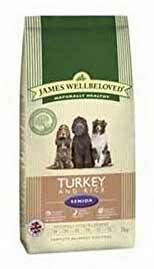 If your dog is sensitive to certain foods, then you should go for a hypoallergenic food like James Wellbeloved senior dog food. It’s made using natural and healthy white meat, which is in the form of turkey and other ingredients that help to combat loose digestion and skin irritation. Another attribute that makes this food suitable for dogs that have sensitivities is the fact that it excludes allergy-triggering ingredients such as wheat, gluten, and dairy products. Instead, the James Wellbeloved has been infused with oats and sugar beet, which not only provide energy but also serve as sources for soluble fiber to keep your pup’s gut in tip-topcondition. It also contains brown and pearl rice, which are incredibly easy to digest; linseed oil, to boost his coat and skin health; and natural protein to boost his muscle development. If your dog has grown older, you might have noticed that he is starting to have trembling legs. Often, this is a sign that he has weak joints due to muscle loss. It could also be caused by an underlying condition such as hip dysplasia. To combat this condition, look for foods that are rich in Glucosamine and Chondroitin for joint support. 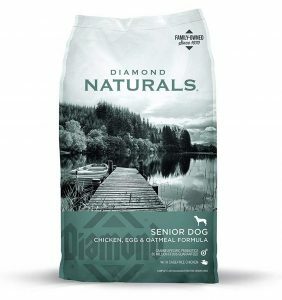 One such food that contains both ingredients is the Diamond Naturals SENIOR Dry Dog Food. Apart from these two ingredients, this dog food contains premium-quality protein obtained from a realcage-free chicken. Such protein will provide your pup with the amino acids he needs to develop muscle. As its name suggests, this is an all-natural senior dog food that’s enriched with vitamins and minerals. Also, it has specific probiotics for optimal nutrition and digestive support. ​​At What Age Should You Switch to Senior Dog Food? The answer to this depends on two main things: the breed of your dog and his health status. Large dogs tend to mature more slowly than small breeds. Toy breeds like Chihuahuas and terriers are considered seniors when they reach 10 or 12 years. On the other hand, large dog breeds reach maturity by the time they are 5 or 6 years. On average, a dog that is 7, 8 years or older is considered a senior. As your pup ages, you will notice a deterioration in his health and stamina. His body won’t be able to repair itself easily and normal body functions will become a challenge. Since the metabolism of senior dogs slows down considerably, they won’t require as many calories as they’re used to getting. Even though senior dog foods are designed specifically for older dogs, they are not the best fit for all pets, especially in instances where the dog has a specific medical condition. If your dog has been diagnosed with diabetes or has failing kidneys, the best diet is one that tackles this problem. Ensure you take your pooch for routine exams and blood tests to determine the best diet for his needs. Can One Still Feed His Senior Dog with Adult Food? Yes, there is no problem in giving adult dog food to a senior dog. But this should only be done if the dog has no underlying medical condition, is active and is neither underweight nor obese. But if you’re not sure of what food to give your senior dog, consult your veterinarian. What Should One Do if the Senior Dog Refuses to Eat? If your dog won’t eat any of the food you’re buying him, the first thing you should do is take him for a complete vet exam. This will help to rule out the existence of medical conditions. If the problem is not related to any health problem, then there are a few tricks you can use. It could be that your dog is refusing to eat because he’s finding it difficult to chew the large kibble. If this is the case, feed him smaller pieces. You can also moisten the food with water or incorporate a nutrient-dense canned food to make it easier for him to chew. Another option would be to switch to homemade diets. Good examples of homemade recipes include boiled rice, vegetables, and chicken alongside vitamin and mineral supplements. To sum up, the best dog food for older dogs will depend on several factors such as his health, preferences, and breed. Some senior dogs prefer dry dog food while others may require their foods to be moistened to make chewing easier. Ultimately, pet owners should be prepared for a trial and error process. Different dog breeds respond differently to senior dog food brands so it might take a while to find the perfect choice for your pooch. 3 ​​At What Age Should You Switch to Senior Dog Food? 4 Can One Still Feed His Senior Dog with Adult Food? 5 What Should One Do if the Senior Dog Refuses to Eat?